“Good afternoon, Eugene. You’re tuned in to 88.1 fm campus radio.” This is what you might hear from one of our 70+ students DJs on KWVA, a student-run, college radio station located in Eugene at the University of Oregon. KWVA 88.1 went live for the first time in May of 1993, and has broadcasted 24 hours a day, 365 days of the year, ever since. KWVA is a place for students and community members alike to share their voice. Whether it is about sports, music, or news, volunteers keep the station running, and their listeners engaged through eclectic content. It’s the perfect setting for students to gain broadcast experience in a hands-on, interactive space. Also, it is a station that plays music you will never hear anywhere else, as it’s comprised of 90 percent student programming. Each each hour on the air is unique. KWVA prides itself in broadcasting real people, not music robots, all year round. We even have DJs pulling the graveyard shift! Students and community members are dedicated to making KWVA an organization that continually interacts with listeners through ticket giveaways, live in-studio performances, events, and music festivals. UO student incidental fees fund the major portion of KWVA’s budget. The station also relies on contributions from the community to help keep our music programs, sporting events, public affairs shows and news broadcasts on the air live 24/7, 365 days a year. 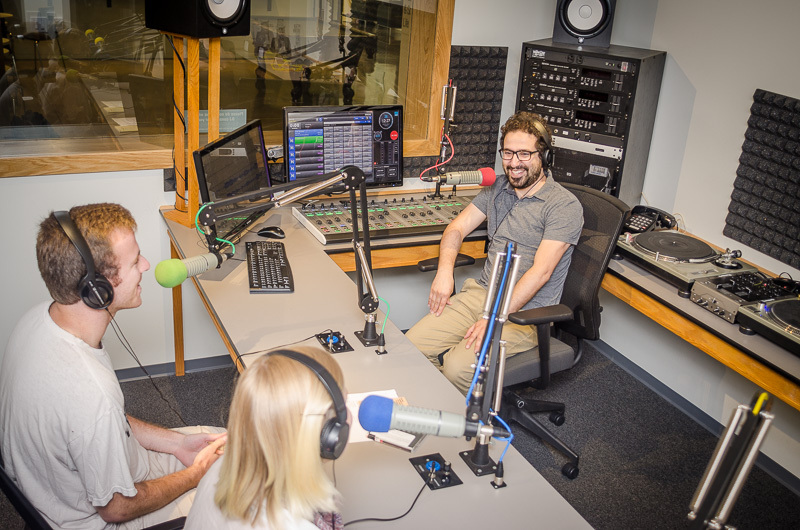 Volunteer student and community on-air personalities program their own shows, which include music, sports, news and talk programming over FM radio and streamed on the Internet. As KWVA continues to grow, so does our potential to serve the students of the University of Oregon and the members of the community in which we live. We are working on documenting the history of the station. If you were involved with the station, we would love to hear from you! Contact the KWVA General Manager and tell us about your time at KWVA. How can I listen to KWVA? KWVA broadcasts live 24 hours/day, 365 days/year. If you are in the Eugene/Springfield area you can receive the signal at 88.1 on your FM radio dial. Anyone can listen live over the Internet with your preferred media player via our two MP3 streams .Click here to listen online. For reception or stream problems, contact the KWVA Engineer at engineer@kwvaradio.org. KWVA plays everything! Or just about. We strive to play things that you do not hear elsewhere. Our DJs have eclectic tastes and our programs vary from one extreme to the other. Our primary format is musical, but we also play news every weekday morning and evening and talk shows almost every day. Take a look at our program schedule for more specifics. Does KWVA play just music? KWVA produces a variety of non-music programs including Anarchy Hour, Health Matters, Arts & Culture, ASUO Radio, and Quack Smack. We broadcast the syndicated news program Democracy Now! [Monday-Friday 7-8am]. We also broadcast campus related, student produced news [Monday-Thursday 7-8pm]. Are there real DJs or computers playing the music? Real people 24/7, 365 days a year. KWVA DJs and announcers broadcast their shows live, even in the middle of the night. KWVA DJs are students and community members in the Eugene/Springfield area. Stop by the station and pick up an application. Click here for more information. Can I volunteer at KWVA? We have lots of opportunities. Click here for more information. Can I work at KWVA? Can I submit music to KWVA? Contact the KWVA Music Director (music@kwvaradio.org). I’m a listener and I just replaced my library with MP3s. Do you want my old vinyl records, CDs, cassettes, 8-tracks, etc? Yes! We’d love to take your old music donations and use them in our library, or if we already have copies we’ll use them during our music swap as a station fundraiser. Your donations are tax deductible too! Contact the KWVA General Manager for details. Can I donate stuff to KWVA? Yes! KWVA accepts all kinds of donations. A portion of our operating budget comes from our generous listeners. We scrimp, save and salvage any way we can but your donations really help us out. If you have music related stuff you want to donate, equipment, office supplies, or anything else, contact the KWVA General Manager with details. What is this great song you’re playing right now? We post currently playing and recently played tracks on the left corner of our home page. You can also see KWVA playlist history at Spinitron.com Or you can call the DJ at 541.346.0645. KWVA is located on the University of Oregon campus on the ground level of the Erb Memorial Union, the student union–Suite 45 next to Falling Sky. The office is staffed and accessible to visitors only during business hours, 10am-5pm Monday-Friday. Musical, informational and cultural programming from the student perspective for the student population and community at large. Practical experience for students in news, sports, weather and entertainment broadcasting. A voice for the student body in community affairs. An interactive, open forum for student expression. Emphasis on student and campus affiliated groups and their activities. Training in the management and operation of a radio station. Responsible, conscientious programming that sets a progressive example for the University as well as the Eugene-Springfield community.